Two hundred ninety-three college students responded to a measure designed to examine retrospective accounts of the physical affection received during early childhood. The study looked exclusively from the perspective of the adolescent. Assessing the importance of touch in human development, and the role it plays in adult attachment and the ability to form and maintain close and intimate relations with others was the purpose of the study. 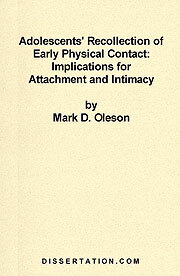 Six separate measures were used to assess the role of touch in adolescent development: three items from Gupta and Schork to assess physical affection (touch); Simpson's attachment style measure; Gerlsma, Arrindell, Van der Veen, and Emmelkamp's parental warmth measure; and Rosenthal, Gurney, and Moore's Erikson Psychosocial Inventory Scale to assess intimacy. Also, one- item measures to assess trust and parents' marital satisfaction were all utilized in this study. Results confirmed statistically significant relationships between parental warmth and touch, warmth and attachment, and intimacy and attachment. Related literature supported the findings of the study and point to the importance of parental warmth and touch in early childhood for competent social and emotional development during adolescence. Implications of the results and possible areas of future research are discussed. Emotion Recognition after Traumatic Brain Injury (TBI) - A General or a Selective Impairment?